French defender Raphaël Varane is all set for a shock Real Madrid exit. According to reports in the French media, the World Cup winner is considering a move in the summer despite having three and a half years left on his contract. Varane has enjoyed a really good time since joining the Los Blancos back in 2011 from Lens. During eight years in Madrid, he has already won four Champions League titles, 2 La Liga crown, and 1 Copa del Rey title. In total, Varane has won 16 trophies at Madrid so far. His understanding with the club captain Sergio Ramos in the heart of the defence has been a crucial factor for Real Madrid’s success in recent times. However, Madrid have struggled at the back throughout this seasonMaybebe the constant rotation in the backline along with the inability to decide who is the first-choice keeper have affected Madrid time and time again. The Los Blancos have already conceded 32 goals in all competitions this season and it is no shock that their season has literally ended in the beginning of March. 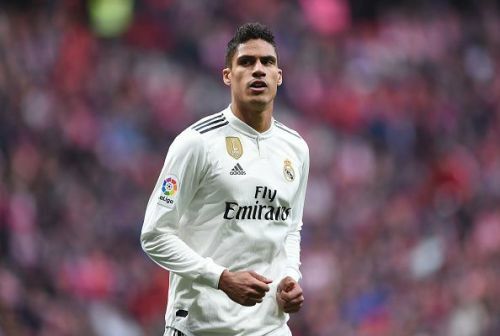 According to L'Equipe, the 25-year-old centre-back is seeking for new challenges because of the fact that he has won everything there is to be won in the famous white shirt and his development as a player has stalled due to the lack of competition in Madrid. If a player is clamoring for a new challenge and has the ambition to be proven in different leagues then it becomes really difficult for the club to hold on to that player. But, the relationship Varane shares with Zidane can be the deciding factor in the outcome of his future at Madrid. Though L'Equipe is a trusted source, it remains to be seen whether Varane will opt for a shock exit from the club. There'll be no shortage of suitors for Varane, with Manchester United known to be huge admirers of the Frenchman.